Have you ever asked yourself why intelligent people let bad habits keep them from living happier and healthier lives? I ask myself that question all the time. We live in a world where 30-second YouTube and Facebook ads offer instant solutions. We shouldn’t be surprised when easy solutions don’t work: There are no magic bullets, no quick fixes on the path to lasting change. People are overwhelmed with options today. It’s beginning to seem that the more solutions there are, the harder it is to find one that works. Programs that promise easy change fail because they gloss over the necessary stages that people have to go through on the path to lasting change. People who regain more weight than they lost by following the latest fad diet are victims of programs that ignore the need for a lifestyle change. Many people have learned the hard way that lasting change is only possible when you have the right information. New Year’s resolutions usually fail. They don’t work because people jump into them without the right preparation. As I learned from Jake's experience, you can’t be successful in the action stage if you haven’t been successful in the preparation stage. My research from watching Jake tell me that anyone can change, if you have a compelling reason to change—and the right strategy to guide you. A bad habit is like an iceberg. You can’t beat a bad habit if you treat it as if it were only as big as what you see on the surface.Whatever it is, you can beat it if you take the time to reevaluate your life. 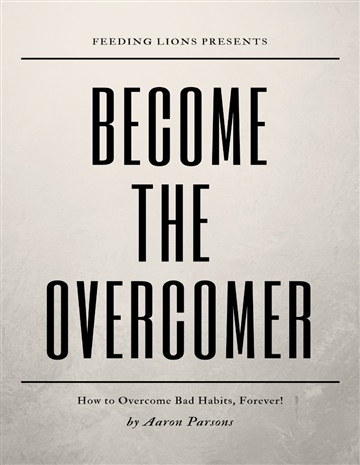 It will take a serious commitment on your part, but you already took the hardest step by consciously recognizing the problem.Download this step-by-step guide and start creating a happier and healthier life today so you can become the overcomer! Aaron and Charlene Parsons write for Feeding Lions.com. They wanted to originally share our self-improvement, body maintenance, and health tips but will be writing blog posts on self-improvement, motivation, productivity, and mental health. They aren’t satisfied with the status quo of their emotional and mental health and are recording their journey to being more energetic and being filled with joy through self-improvement.They want to prove that being mentally healthy, and whole is unbelievably simple. They hope you’ll come along and share in their journey. Aaron and Charlene want their readers to become metaphorically powerful, bold, influential lions who can change the world. They’re here to help you become the strong lion you were meant to be.